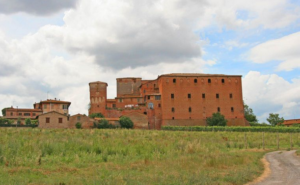 The mighty bulk red brick of the Cuna Grange is one of the best preserved examples of medieval fortified farmhouse, in addition to being one of the most unusual and interesting architectural complexes, in the province of Siena. Stands where already in the 12th century there existed a Hospital dedicated to welcome and give assistance to pilgrims and merchants passing along the Via Francigena that close, crossed the Arbia. Turns out, by a document of Pope Eugene III, that this building belonged to the Abbey of towers. The entire County became the property of Siena during the 13th century, but the farm on ‘ poggiarello di Cuna and Castelluccio ‘ was donated to the Hospital of Santa Maria della Scala, one of the most powerful institutions of the time.